A great way to get kids more involved with the holidays is to do some fun and easy do it yourself projects. It is amazing how much children LOVE helping us create! 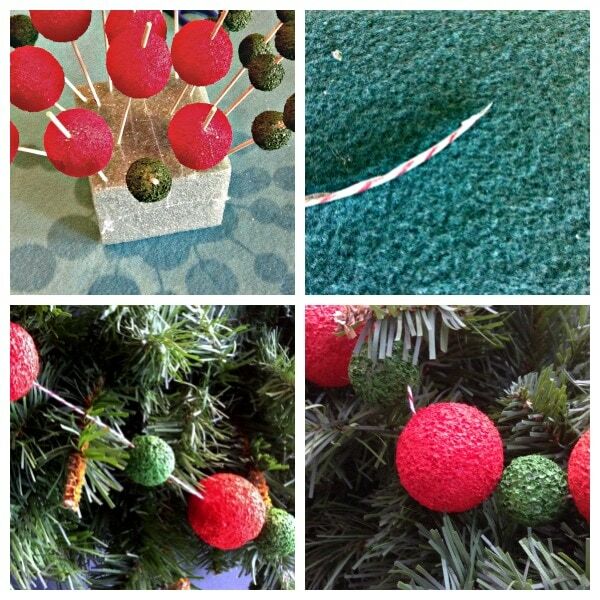 This DIY Christmas Garland made with styrofoam balls is a quick craft project and looks great on the Christmas tree. Easy craft projects are my favorite! 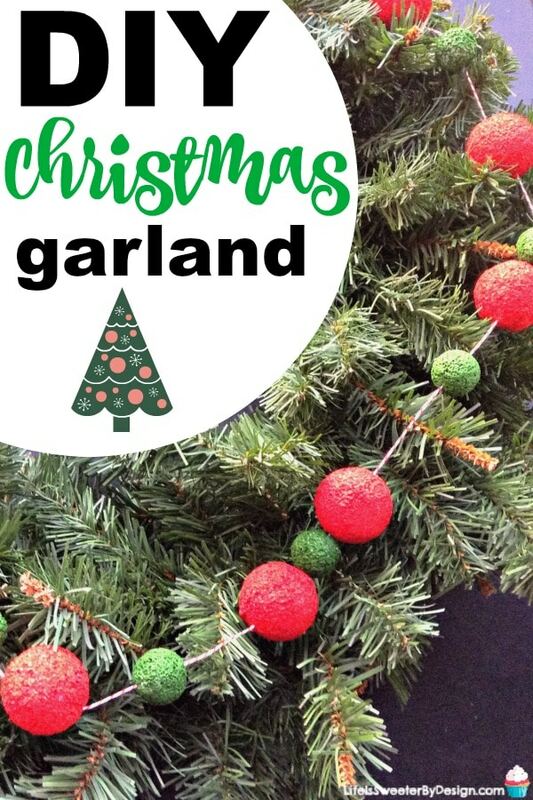 This particular DIY is so versatile and is a great way to make a customized garland for themed trees. ribbon , twine , yarn, etc. Decide how long you want your garland to be. This will depend on what you are wrapping it around. If this is for a wreath it won't have to be as long. If this is for a Christmas tree it will need to be much longer. 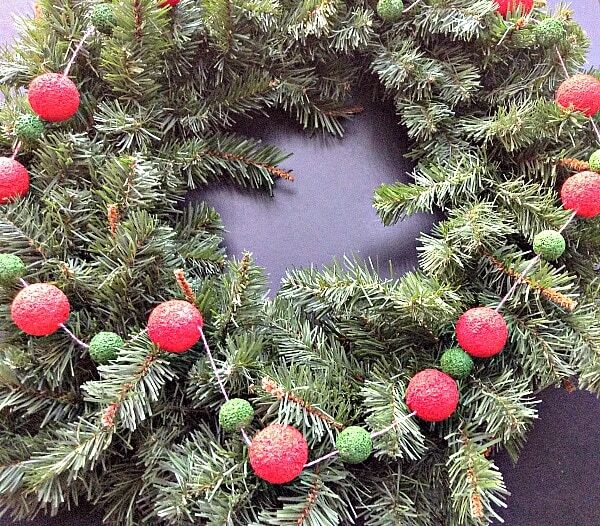 The length of the DIY Christmas garland will determine how many styrofoam balls you will need. It is fine to add more as you go along! First take the styrofoam balls and stick a wooden skewer through them. You can then stick the skewer into a floral foam block so that they are standing upright. You now need to paint each ball on all sides. It is very easy to paint these since they are on the skewer. I preferred to paint all the big styrofoam balls one color and the smaller ones another color. It is totally your choice! Allow the balls to dry completed. Take your twine, ribbon, etc. and put a piece of clear gift wrap tape around one end tightly. This will make it easier to thread the string through the styrofoam balls. Start stringing the balls onto the twine. Spread them out to intervals that you like. You can even add small beads in between the balls if you want to get even fancier. After the balls are on the garland I tied a small knot in each end of the twine. Now go wrap the garland around something! Where Will You Hang Your Garland? So where do you plan to use your DIY Christmas garland? What colors will you use? My daughter has a white tree that she trims out with pinks and gold…I may make another one with her for that small tree! So many options! Be sure to check out my tutorial for a simple Vintage Wooden Spool Ornament. It looks great on my vintage Christmas tree!